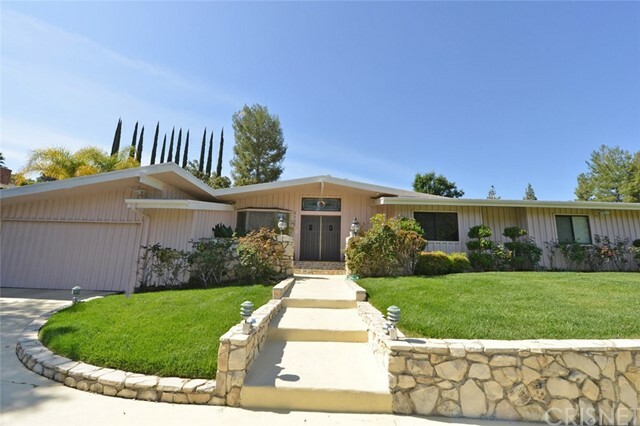 Spacious Ranch style home in a highly sought-after Tarzana neighborhood South of Ventura blvd. This well-maintained cosmetic fixer is the perfect home for that buyer looking to have privacy and security. Offering a fully gated and private circular driveway, plus a 3-car garage. This single-story home offers an open floor plan with cathedral beamed ceilings throughout, granite counters, custom cabinetry, recessed lighting, pecan, walnut & marble floors. Large master suite with sitting room, 2 walk-in custom closets, and bathroom with Swedish wet/dry sauna. Some additional features include wine closet, family room with fireplace & wet bar. Cozy library/bedroom with custom built in book shelves. Cooks kitchen with double convection ovens, and six burner Bosh hot top. The entertainers back yard is perfect for entertaining guests or just relaxing with two expansive patios, a sparkling pool, and complete with mature landscaping for additional privacy. Aggressively priced to sell, wont last long. © 2019. The multiple listing data appearing on this website, or contained in reports produced therefrom, is owned and copyrighted by Multi-Regional Multiple Listing Service, Inc. ("MRMLS") and is protected by all applicable copyright laws. Information provided is for viewer's personal, non-commercial use and may not be used for any purpose other than to identify prospective properties the viewer may be interested in purchasing. All listing data, including but not limited to square footage and lot size is believed to be accurate, but the listing Agent, listing Broker and MRMLS and its affiliates do not warrant or guarantee such accuracy. The viewer should independently verify the listed data prior to making any decisions based on such information by personal inspection and/or contacting a real estate professional. Listing courtesy of Scott Pinkerton from Century 21 Peak . Last updated Monday, April 22nd, 2019.